With a high concentration of anti-ageing active ingredients contained in the Regecell X5 patented formula, the Perfecting Cream Masque acts instantly on signs of fatigue and brings youth and vitality to the skin. Composed of plant extracts and hyaluronic acid, this powerful regenerating cocktail offers demanding a way of effectively and instantly correcting wrinkles and skin slackening. 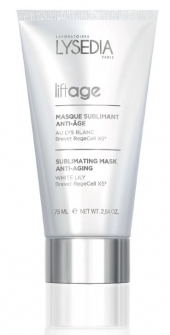 Application of the Perfecting masque makes the skin look instantly younger. It immediately erases signs of fatigue and gives the skin new vitality. Hydrated, smoothed, plumped, revitalised and soothed, it enjoys new lustre. A masque, and much more. And first and foremost a surprising creamy and enveloping texture that combines the powers of a cream with the plenitude of a masque. With a delicate floral fragrance, this gentle, creamy masque is a pure moment of pleasure. It melts on contact, providing a second skin with restoring powers and an unparalleled velvet finish. Apply to clean face and neck three times a week. Leave to work for 20 minutes and then remove surplus using cotton wool. Formulated without parabens and phenoxyethanol. Dermatologically tested. PRICKLY PEAR OIL antioxidant, nourishing and softening. SPIRULINA revitalizing, fortifying and nutritive. WHITE LILY softening, brightening and healing. HYALURONIC ACID hydrating and plumping. THALASSINE ® an anti-wrinkle active ingredient with botox-like effect.